Relaxing the mind brings the brainwave activity back to lower frequencies known to be healing and beneficial for our body. At around 40 hertz the activity of the mind overwhelms the brain. Concentrated action and learning dominates the moment. There is no time for the brain to heal us, nor is the voice of the soul heard. We are dealing with urgent matters. At around 30 hertz we’re doing our job well or engaging in a sensible conversation. The mind is alert. At around 20 hertz our mental activity is slowing down, but still in full consciousness. We joke with our colleagues while performing light tasks. At around 10 hertz we’re relaxed, walking in a park or doing repetitive actions that disengage our mind. We start connecting with the signals of our body, and our soul is free to live in the Now. At around 5 hertz we’re daydreaming, meditating or taking a nap. The brain starts to heal the body. At around 2 hertz we sleep tight, the brain connects with the body and the soul connects with the Universe. It’s the ultimate healing moment as the Self is freed from the chatter of the mind. With hundreds of visual impacts emerging from our screens daily combined with the rush of meeting deadlines and adjusting to a hectic shedule, our mind runs in overdrive. They induce high frequency brainwaves, preventing the brain from doing its initial job, which is the coordination of all the cells in the body through feed back mechanisms. Moreover, our sleep at night is highly affected by all these impulses during daytime. This increases the risk of memory loss and dementia, starting with a condition we call “Brain fog”, or the clouded brain unable to take clear decisions. The newly developed device for Induced Meditation reduces the activity of the mind and brings a deep relief in our mental state. After 20 minutes of Induced Meditation the frequency of our brainwaves drop and your brain starts its healing task. After a session of Induced Meditation you can resume work with a clear mind. Insomnia, anxiety, depression, stress and restlessness of the mind, are all benefiting from this technique. A personalized program of beauty, health and mental strength, based on the laws of nature. Stress, pollution, bad food habits and emotional instability take a toll on your quality of life. Your beauty fades and lifestyle diseases are more prominent than ever. On regular intervals we need to take our short “Health Break”. Preferable near our home. Lose weight, regain vitality, improve your metabolism, enhance your beauty and restore mental and emotional balance. Our spa concept is unique in its kind. Designed by leading scientists and food experts on health and beauty, the IKARI spa, as it’s called, is the result of decades of research on rejuvenation. Three pillars are at the base of the program: a beautiful skin, a healthy body, a strong mind. Based on three patented technologies. A beautiful skin with your skin type technology and IKARI cosmetics, our personalized Swiss brand of skin care. A healthy body with personalized food, supplements and a lifestyle program according to your body type. A mental rejuvenation with the induced meditation and awareness program. You are unique, and so is your skin type. No wonder that the pattern on your skin, your fingerprint, is conclusive to identify you. Only a skin care regimen that respects your skin type will work. Your Skin Type method for skin analysis is IKARI’s forte. Your stay starts thus with a skin analysis that generates a unique code, your skin code. A search engine determines your skin care program and customizes your skin care products: Cleansing, toning, care of specific problems with adapted serums, day and night care, sun protection and the healthiest for of make-up based on pure minerals. This is followed by a live demonstration how to apply and use the products. Experience has taught us that many errors in skin care are due not only to poorly adapted products, but also to a wrong skin care ritual. You’ll master the art of layering and learn how to feed the skin with the right amount of product on each area of the face. The results are immediately visible. The skin complexion becomes bright and natural. The Superboost is IKARI’s secret weapon. The dream of gently inserting active substances deep into the skin is now a reality. Solutions containing IKARI’s potent ingredients are infused through the pores to reach the deepest layers of the skin. Rejuvenating the skin, fighting acne and clogged pores or dealing with an uneven complexion. The treatment is followed by masks imbibed with those same solutions and a session of LED light, a low level laser light that fights ageing. According to the laws of naturopathy each body has its own energetic fingerprint, your body type. A Body Type test determines the distribution of the energies and reveals imbalances that might affect your health. Overweight, cellulite, mood swings, menopausal complaints, bad digestion, fatigue, impaired memory, bad circulation and slow metabolism are some of the issues tackled during your stay. The appropriate approach consists of heathy food adapted to your body type, the right food supplements, potent tea varieties and adjustments in your lifestyle. Your Body Type test ends with a color code reflecting the distribution of your energies. At the buffet of your Spa and Hotel you will find the matching color codes near each dish. Thus allowing you to balance your energy with food in a very intuitive way. The special Asian wooden steam cabins will help you further in this process of detoxification of your body. Quite quickly you feel the difference in bowel function and energy level. At any time your food coach will assist you in your personal regimen. Furthermore, you can choose between three detox programs, one for your gut microbiome, the second for your sugar intake and the third to balance your energies. The right food and a proper detox program can act as a real medicine, relieving you from debilitating symptoms. Nothing has more impact on your health than a stresses out state of mind. Multiple conditions such as heart diseases, central nervous diseases, irritated bowel, skin disorders, diabetes and even cancer, have been related to a heavy or prolonged stress situation. That’s why meditation is advised as a confirmed cure for many disabilities. Unfortunately, it’s not easy to meditate on command nor to reach a deep state of meditation, necessary for a healing effect. Induced Meditation is once again the secret weapon of IKARI. This device is bases on a 5000 year old technique of mental relaxation, by stimulating the region of the “third eye” on the forehead. This spot is connected to the pineal gland, the brains central commander. After several minutes under the Induced Meditation device the mind reaches a deep state of meditation. This meditative state is sustained for an additional 20 to 40 minutes. The result is a balanced mind and the ability to make clear and focused decisions. A specially designed Awareness Program is combined with the Induced Meditation sessions. Your consultant will guide you through the laws of nature governing your journey on path that is yours. A stay at IKARI Spa is more than a pause in your hectic schedule. It’s the first step towards life changing transformations. By first assessing your detailed profile on skin, body and mind, all following actions will fit your needs perfectly. Trying to break with bad habits is good. But only by following new rituals that are yours, the process becomes miraculously effect with time. Get rid of bad skin days, threatening lifestyle diseases and mental stress with programs that work. Transform your restaurant meal into a health experience. As stated in the book, Your doctor is a cook! Select the right food according to the recommendation of the Body Type Test and restore the balance in your body. The Your Body Type color code is specifically designed to guide you through the menu. You’ll be surprised how tasty food can pacify your energies. 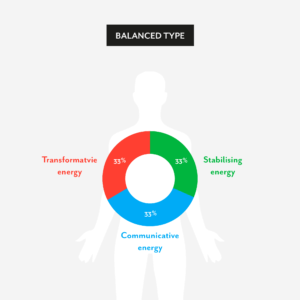 Your Body Type test ends with a color coded chart: a circle representing your three energies in three matching colors, green, blue and red, and their the percentage. 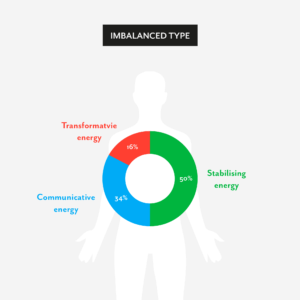 An ideally balanced body will show about 33% for each energy type. Lower or higher percentages of any energy type, can be corrected with food, tastes, lifestyle and herbs (our organic food supplements). The page of results sent to your e-mail contains a link to all these options, thus facilitating your daily care. For selected restaurants or at the buffet of an IKARI Spa hotel, we provide an easy tool to select the balancing food, based on your color code. Each dish or menu is linked to a color code too, revealing the influence of this food on your three energies. On every dish in the restaurant, a three color code is displayed indicating the type of energy attributed to that dish. Choosing more of the adapted food choices will increase your health and digestion. The algorithms to match the color code of the food to the color code of the Body Type are reviewed with the kitchen Chef. 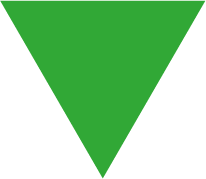 The arrow pointing downwards reduces the corresponding energy. The arrow pointing upward is enhancing the corresponding energy. A circle keeps this energy neutral. If your percentage of “red” energy is low on your chart, go for a dish with dominant “red enhancing” food. 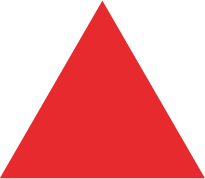 If your percentage of “red” energy is high on your chart, go for a dish with dominant “red reducing” food. If your percentage of “red” energy is balanced (33%) on your chart, go for a dish with “red neutral” food. 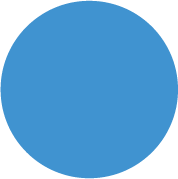 The same goes for the two other colors, blue and green. How to read your chart? Look at the colors that are above or below 33% and try to correct them with your food. How to choose your food? Try to eat a balancing meal where all tree colors are represented. Correct your imbalanced chart with some of the corresponding colors adjustments in your food. For the customer is really intuitive. More of blue on the chart, less blue in the plate! Example: How to read this charts and match its balancing meals? On the chart, the red energy is too low (16%), the green energy is too high (50%), the blue energy is neutral (nearly 33%). Chose the meal that increases the red, reduces the green and keeps the blue neutral.